The new technology inscribes data into five dimensions (thus, 5D) on “nanostructured glass” using a powerful laser. 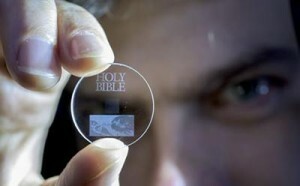 As you can see by the photo above, an enormous document like the Bible can be quickly reduced to a few specks of data. With 360 TB of memory storage, you wouldn’t have to limit yourself to a single book. However, an even more daunting question looms now: where do you store an archive that will outlive the Earth itself? Filed Under What Does the Future Hold?. Bookmark the permalink.